Melbourne loves their doughnuts, and testament to this is that Melbourne (don't know whether this is a good thing or not) have all of their Krispy Kreme establishments in tact, while in Sydney several stores have closed down. 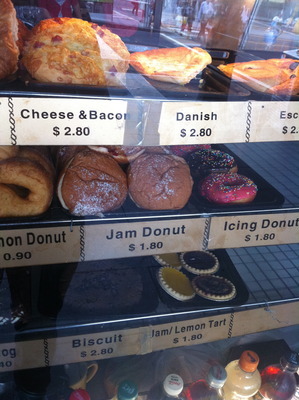 The jam doughnuts were something great to grow up with, and recent sugar cravings have got one to discover them here in Melbourne. No need for any heat and eat packets from the supermarket. The jam doughnuts (for only $1.80 a pop) at Flinders Station Bakehouse at Flinders Street train station are just sensational, especially with the abundant, filling dough and the red jam just pouring out. There was one occasion where the jam was a yellowy colour with a lemony taste, and nothing poured out. A great jam doughnut that will satisfy any late afternoon sweet cravings that cannot be surrendered. Just ensure the jam is red before purchasing. I know this sounds bizarre coming from a Vietnamese food establishment, yet this is one tasty treat. Needless to say, it makes for a great companion for a walk to any one of the nearby parks, or to the National Gallery of Victoria art galleries.